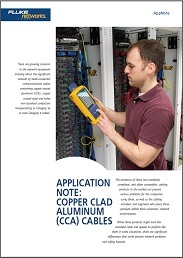 What is Copper Clad Aluminium cabling? As aluminium is cheaper than copper sadly copper cladded aluminium cable (CCA) is on the increase, masquerading as Category 5e or even Category 6 cables. The existence of these non-standards compliant, and often counterfeit, cabling products in the market can present serious problems for the companies using them, as well as the cabling installers and engineers who place these products within their customers’ network environments. While these products might look like standard cable and appear to perform like them in some situations, there are significant differences that could present network problems and safety hazards. Read this Application Note from Fluke Networks to ensure you are aware of the issue and know what to look for.